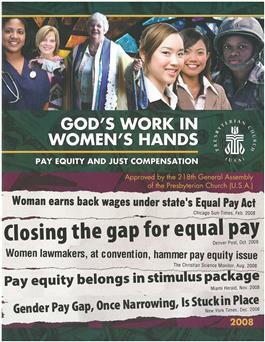 This resolution, approved by the 218th General Assembly (2008), explores equal pay for comparable work concerns. What factors contribute to women's earning 78 percent of what men make, even in the church? This carefully researched report analyzes differences in education, skills and experience as well as gender and racial discrimination to back its recommendations for implementing equal pay for comparable work. Recognizing that ""the new reality in Christ"" should be reflected in the quality of the church's common life and witness,"" this resolution encourages all Presbyterians to uncover and correct unjustified pay disparities.